Bond Economics: Fiscal Crisis Sighted! Break Out The Popcorn! Fiscal Crisis Sighted! Break Out The Popcorn! Apparently we are due for some excitement in Treasury market, as per the analysis in "A Debt Crisis is on the Horizon," penned by the luminaries Michael J. Boskin, John H. Cochrane, John F. Cogan, George P. Shultz and John B. Taylor. As a regular reader might suspect, I am somewhat skeptical about the claims in said article. That said, one may note that the discussion therein is not totally incompatible with a Functional Finance framework, although we would need to paraphrase what they wrote. However, the interest rate determination part of the article is pretty weak. In summary, debt levels are projected to go higher, and if interest rates rise, the interest cost will rise by even more than projected. This spending presumably would have an inflationary effect, and the Federal Reserve's usual reaction (to raise the policy rate in response to higher inflation) would validate higher bond yields. Is such an outcome possible? Sure, why not? However, it's not as if the market is not pricing such a possibility. If you happen to be a fixed income market participant, call up your friendly interest rate derivatives counter party and ask for an indicative quote for a payer swaption on a 10-year tenor, either 10 or 20 years forward, with a strike of 6%. Voilà - there is your price for a high interest rate scenario. Disclaimer: I am definitely not recommending such a trade, unless the price is a lot lower than I think it is (I lack swaption price data). Long-dated, out-of-the-money payer swaptions have wrong way risk: they only pay off when the value of future money has presumably plummeted. If you believe the hyperinflation bugs, your profits might not be enough to fill your gas tank. As is well-known, our deficit and debt problems stem from sharply rising entitlement spending. Without congressional action, the combination of the automatic spending increase per beneficiary provisions of these programs and the growth in entitlement program recipients as the population ages will cause entitlement spending to continue to rise far faster than U.S. national income and tax revenue. Is this a plausible fear? I am going to dodge the question. I looked at this issue years ago, and my analysis was that this was a snooze-fest. However, my analysis is now out-of-date, and so I will leave this to more interested parties. However, I would note that the demographic issues that they cite are slow-moving processes. The inflation of the 1970s developed over a long time span, and there is no particular reason to believe that this time would be any different. If one believes in DSGE macro, one could argue the markets will move to discount future problems much earlier, and it is reasonable that we cannot predict when such discounting will occur. (If it were a reliable process, value investing would be the way to quick riches.) As a regular reader of my articles will know, I am highly skeptical about DSGE macro. Realistically, I see no empirical evidence that fiscal policy adjustments now will do anything useful for a potential inflation problem 20 years in the future. Right now, the big demographic bulge is trying to save to build a pension nest egg for the pensioner-heavy future. A fiscal deficit supplies these savers with quality assets for their portfolios, which will act as a counterweight to the risk assets they own. If we attempt to cut off the supply of Treasury securities, private sector financial asset issuance has to fill the gap. For the corporate sector, the earnings before interest is the only thing that can validate corporate financial asset values in the long run. These earnings cannot rise faster than GDP forever, and if one believes in mean reversion, they could be headed the other way in relative terms. Meanwhile, the price of the existing assets is already fairly rich. There is no way of ramming in more claims against that income stream without damaging returns. The alternative is layering even more debt on households. As we discovered in 2008, there are limits to how much debt the household sector can support. If baby boomer attempt to fund their retirements by selling homes or trading down, it is going to be difficult to support rising house prices -- the key driver of household debt. In other words, trying to push asset flows into the private sector beyond its capacity to service the financial assets is a recipe for another financial crisis. 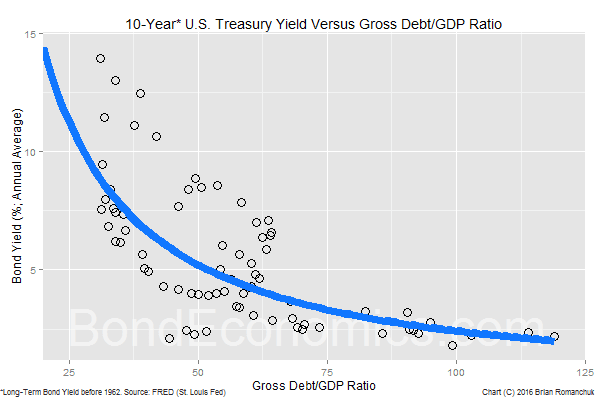 When it hits, the most likely outcome is an even higher governmental debt-to-GDP ratio. If social spending does matters, it will be dealt with by either higher nominal GDP growth, tax hikes, or putting the oldsters onto ice floes. That is a problem for future voters to grapple with. The interest rate analysis is of the same level of quality that one expects from mainstream academic economist op-ed pieces. The first bit of silliness is the analysis of the apparently innocuous rise to an average interest cost of all debt to 5%. Sure, for the regular readers of the Washington Post, a rise to a 5% weighted average funding cost does not seem like a big deal. However, my regular readers are numerate, and so I need to keep in mind one of the basic properties of fixed income assets: income from them is, er, fixed. The Treasury has lengthened the average maturity of its borrowings, and it is going to take a long time (or very high short-term interest rates) to get an average interest cost of 5% on the stock of debt. And since only a small portion of the debt is rolled over at any time, a short-term upset in the Treasury market will have negligible effect on the average funding cost: interest rates have to be sustained at a high level. Obviously, it could happen -- but we have to expect that nominal GDP growth rates are correspondingly higher. Rising interest rates and increasing deficits threaten to build upon each other to send public debt spiraling upward even faster. When treasury debt holders start to doubt our government’s ability to repay, or to attract future lenders, they will demand higher interest rates to compensate for the risk. If current spending and tax policy continue unaltered, higher interest costs will have to be financed by even more debt. More borrowing puts more upward pressure on interest rates, and the spiral continues. While some insulation flows from the dollar’s role as the global reserve currency, that is neither sufficient nor immutable, and relies on faith in the United States’ eventual fiscal probity. When someone brings up the "global reserve currency" to justify their Treasury bear case, they are truly desperate. In summary, the actual arguments they give that suggest that interest rates would rise are hogwash. However, interest rates could rise as a result of stimulative fiscal policy and the conventional central bank reaction function. In other words, they could be right about interest rates, but for the wrong reasons. Therefore, one cannot completely dismiss what they write, but we are stuck with a very difficult analysis of long-term budget and economic forecasts before we could judge whether their policy views are justifiable. Furthermore, since Boskin et al., appear to have such a deep fear of such an outcome, they surely would be leading the charge to make such a change. However, anyone with experience knows that Boskin et al. are exactly the cast of characters who make such a change impossible. If we eliminate the possibility of default, they have lost their political club. They would be stuck saying that inflation might rise in 20 years -- and everyone would think they were idiots. They need the fiscal scare story to provide political cover for their political preferences (cutting social spending, and cutting corporate taxes). This is why it would be a huge political fight to make the administrative change to make default impossible -- even though it appears like one of the easiest positive reforms one could propose. This article highlights the difficulties that even highly credentialed mainstream economists have with interest rates. Their models tell them that the interest rate is largely under the control of the central bank, so they need to come up with stories about the term premium. The problem is that if the term premium behaves in the way they suggest verbally it does, we can run statistical tests -- and reject that term premium model. Obviously, it is possible for the government to make promises that are internally inconsistent; for example, a promise to hand every American citizen one million dollars at age 65 would be inconsistent with a promise to keep the price level close to where it is right now. It would greatly help matters if fiscal conservatives discussed why they believe that social programme promises lead to such inconsistencies -- instead of disrespecting the bond market. * One detail in their argument was particularly delicious. They wanted to explain how scary the debt numbers are by comparing the per capita Treasury debt amount to household wealth. In order to make the comparison even scarier, they compared to the median, not the mean household wealth. The reason is that high wealth inequality implies that the median wealth is much lower than the mean. In other words, the only time Republican economists acknowledge wealth inequality is to buttress the case for cutting social programmes. The bond yield vs. debt ratio chart you show is for data pre-1962. Do you have one which incorporates data to the present time? The data runs up to around 2013. There was a change of definition of the bond yield used in 1962. I think the linked article explains the chart in more detail, or possibly in "Understanding Government Finance", which uses that chart. (I need to run, so I don't have time to re-read what I wrote then...). This is such a fascinating chart. It's clear you are not a fan of mainstream econ taught in most universities today. What do you think about academic Finance? If we are talking pricing theory, and as long as the subject of affine term structure models does not come up, no major complaints. I am more of an efficient markets zealot about the rates market than the authors of the WaPo piece. That said, I have some complaints about portfolio management theory. Academic theories about portfolio management have destroyed a lot of capital. I wrote an article in February - “I Blame the Finance Profs” which covered some of my complaints. However, the ideas that have done the damage are old, and so it’s unclear how much we can blame the current crop of finance academics.